NOCSAE's pneumatic ram impactor, used to test forces on football helmets. Leaders in sports safety gathered Friday in San Antonio to field questions about new equipment standards for sports, including football, baseball and lacrosse. The National Operating Committee on Standards for Athletic Equipment is a non-profit that funds research into sports-related injuries and medicine. They determined that certain rotational forces contribute to concussions during football. This year, NOCSAE issued new guidance for football helmets based on that information. Prior to that, helmets standards relied on linear acceleration tests, when the head moves in a straight line in some direction. "Our standards are intentionally design neutral,” Oliver said, “which means we don't tell helmet companies how to do this. We just say this is the outcome. Your helmet has to do ABCD when we hit it with all these rams and impactors and with all these velocities. How you achieve that is up to you. The new football helmet standard will take effect in November. It will impact all age groups, from children to professional players. A recent study out of UT Southwestern Medical Center in Dallas mapped the brains of student athletes between the ages of 8 and 18 years old, recording how they changed after just one football season. They found that youth football players showed changes in their brains before changes became apparent in their behavior and cognitive ability. 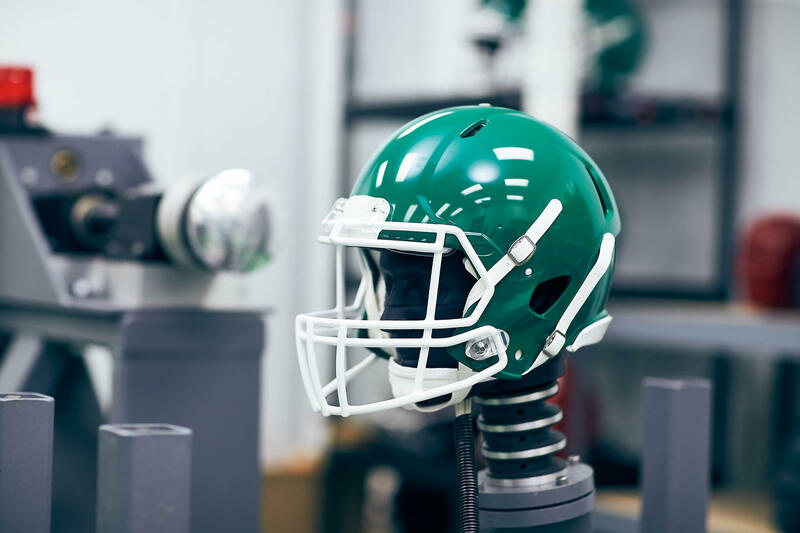 Dr. Robert Cantu, professor of neurosurgery at Boston University School of Medicine and Vice President of NOCSAE, said the next step is creating helmets specifically designed for children's anatomy. "We would not be allowed to hit our children in the head five or ten times without being called for child abuse if one time. And yet youngsters are taking 200 such hits in an average season of playing football,” Cantu said. By current NOCSAE standards, children are treated as miniature adults. Their helmets are held to the same safety requirements — just sized down. The discussion also addressed Commotio cordis, a rare heart rhythm disruption caused by a blow to the chest, which is the second-leading cause of sudden cardiac death in young athletes in baseball and lacrosse. Mike Oliver, the executive director of NOCSAE, said that a few traumatic events are more than enough reason to create better standards. "It doesn't happen every day, but there are fifteen to twenty deaths a year from getting hit in the chest with a lacrosse ball, or a baseball or hockey puck or whatever,” he said. “Most of the impacts are not hard: 40 miles per hour or less." Over nearly two decades, NOCSAE funded more than $1.1 million in research to identify the specific cause of commotio cordis and determined how to protect against it. The new chest protector standard is intended to significantly reduce the likelihood of commotio cordis in baseball and lacrosse players. NOCSAE's new chest protector standard will take effect in June. The horror stories about football and brain damage keep flowing out of the NFL, but surprisingly, little is known about how the sport affects the brains of young players.